We are grateful to Elton John for having given us permission to use his song "Oceans Away" as the official Spirit of '45 Day anthem. Special thanks to Ryan Hegg for creating this moving video. 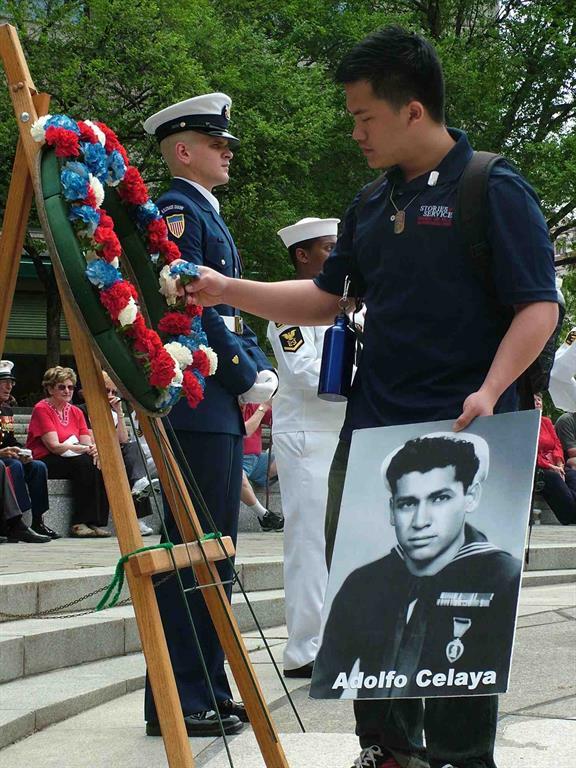 One of the cornerstones of Spirit of '45 Day each year has been the "Tribute to America's Greatest Generation" -- an around the world wreath laying ceremony that takes place on the second Sunday in August in hundreds of communities in the U.S. and countries where American heroes of WWII lie at rest. 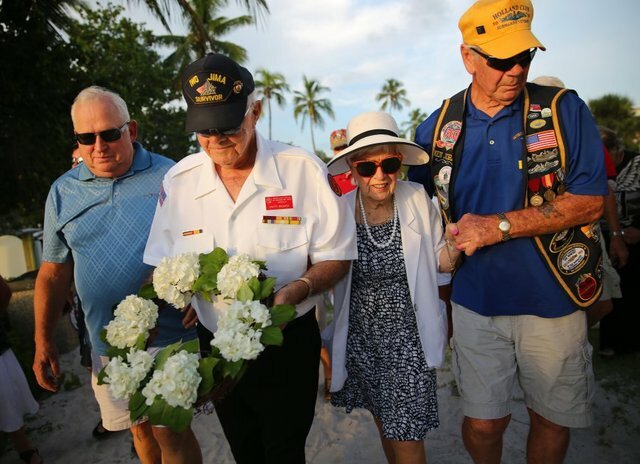 The number of these community ceremonies has increased steadily each year since 2010, as communities across America take this opportunity to honor the courage, shared sacrifice, can do attitude, and selfless service of the men and women who were the ordinary heroes of the WWII generation, so that their legacy will continue to inspire future generations of Americans, especially the youth of our country. 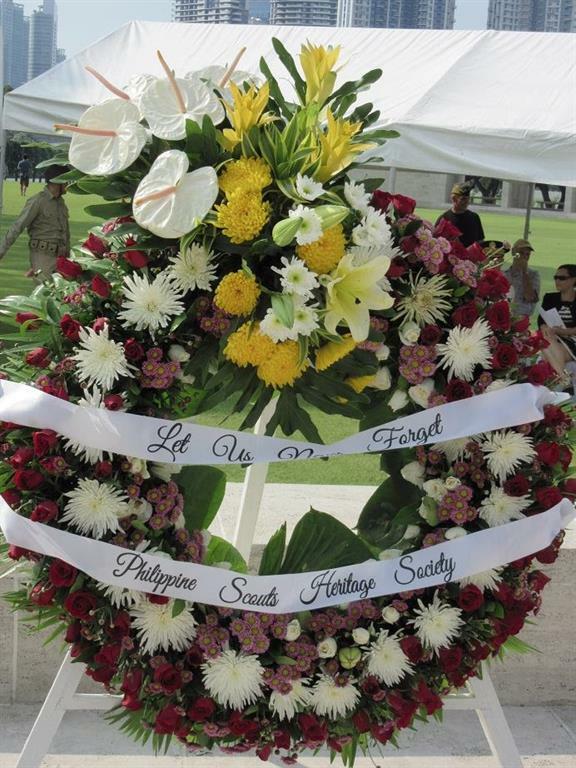 The Tribute begins each year at the American WWII cemeteries in the Philippines, Tunisia, Italy, France, Belgium, Luxembourg, the Netherlands and the United Kingdom, and continues across the U.S. from the East Coast, ending in Hawaii at the National Memorial Cemetery of the Pacific (the Punchbowl) in Hawaii, concluding at the gravesite of the late Senator Daniel K. Inouye, one of the co-founders of Spirit of '45 Day. 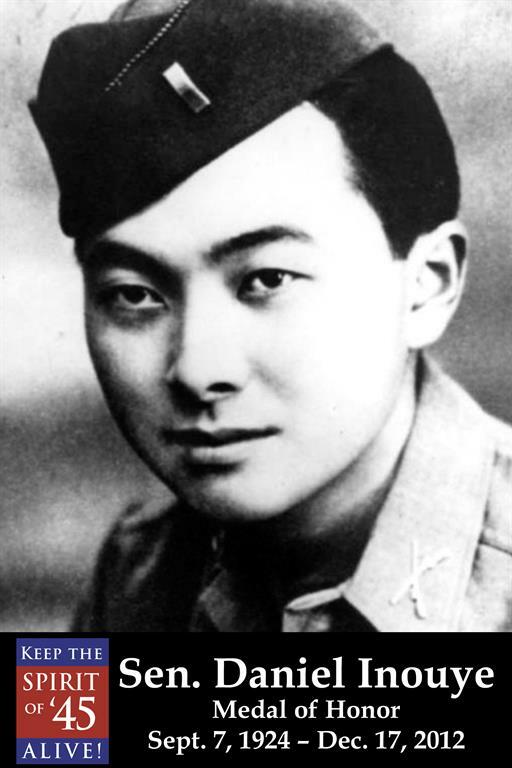 Sen. Inouye served during WWII as a member of the famous all Japanese American 442nd Combat Infantry Regiment, losing an arm in a grenade explosion. 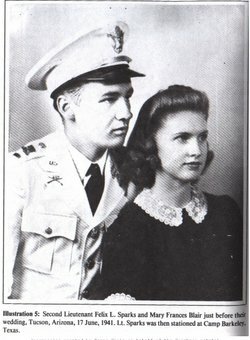 He received many military honors, including the Medal of Valor. He continued to serve his country as an elected official from the state of Hawaii and was the President pro tempore of the United States Senate from 2010 until his death on December 17, 2012. He was awarded the Presidential Medal of Freedom posthumously. The Spirit of '45 70th Anniversary Commemoration Weekend concluded with an around the world wreath laying that began in the American cemeteries in the Philippines, Europe and North Africa, and continued on across the U.S. from the East Coast to Hawaii, ending at the grave of the late Senator Dan Inouye, one of the "founding fathers" of Spirit of '45 Day when it was passed unanimously by Congress in August 2010. 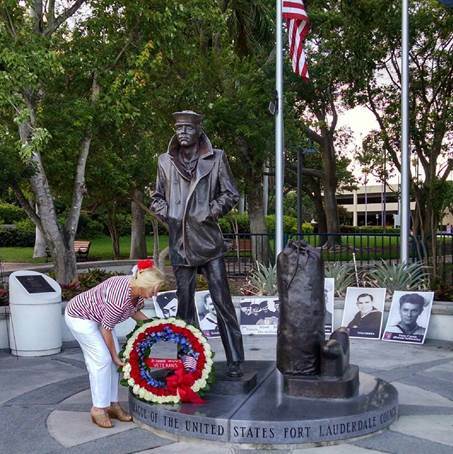 Kathy Begrin, Joyce Means and Nancy Grigsby, place a flower in a Spirit of '45 wreath during a ceremony in La Jolla, CA on August 16, 2015, in honor of Raymond Means (step-father and husband), a World War II veteran who passed away the previous month. The ceremony was organized by Elizabeth Hospice and the Veterans Hospice Partnerships, members of the We Honor Veterans collaborative. 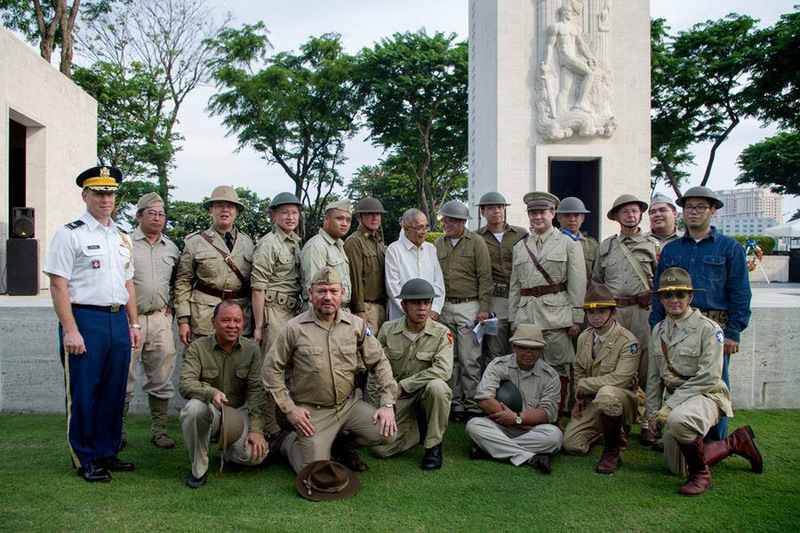 The Philippine Scouts Heritage Society, with the support of “Keep the Spirit of ’45 Alive” coalition and the American Battle Monuments Commission, kicked off the global Tribute with a solemn wreath-laying ceremony at the Manila American Cemetery with several guests of honor including retired Philippine Army Major Jaime L. Guerrero who was a Philippine Scout with the 88th Field Artillery in Bataan during WWII. 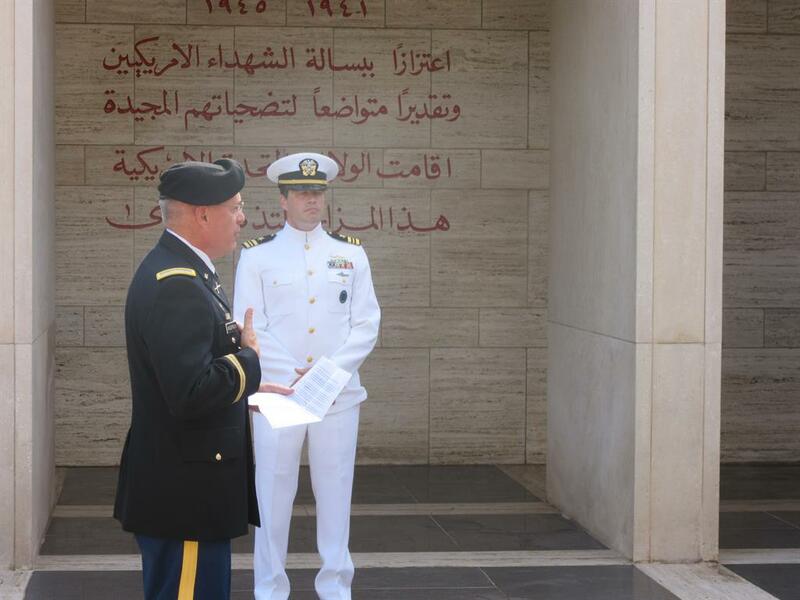 Mr. Foued Bouaziz, Superintendent of the North Africa American Cemetery in Tunisia, organized a very special 70th Anniversary ceremony that featured a wreath donated by employees of the US Embassy in Tunis as the Tribute continued west across North Africa and Europe. Click here for a summary report with additional photos. 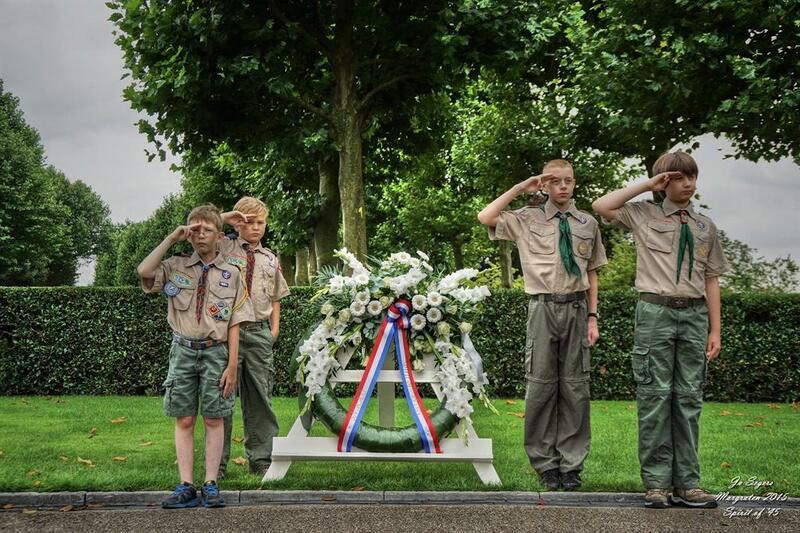 Photos of the ceremony on Sunday, August 16 at the Luxembourg American Cemetery (below) Although the bugler is not in the photos, he did a wonderful rendition of Taps which was followed with the Luxembourg and American national anthems on the Carillon. The speakers were Ms. Alison Shorter-Lawrence, the Chargé d’Affairs US Embassy Luxembourg and the Honorary President of the U.S. Veterans Friends of Luxembourg, Constant Goergen. 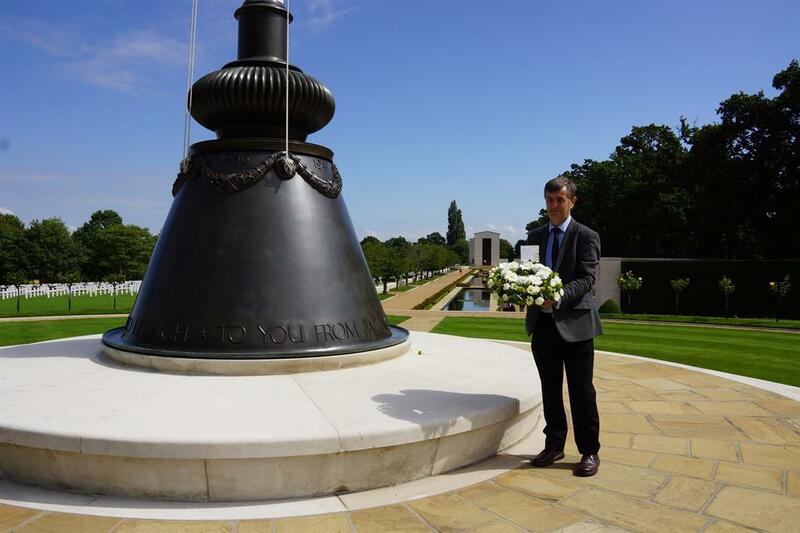 Malcom Donald and Andrew Date from Battlefield Journey took the initiative to organize the first annual Spirit of '45 70th Anniversary Commemoration wreath laying under a beautiful summer sky at the Cambridge American Cemetery and Memorial in England where more than 8,000 American war dead are buried. 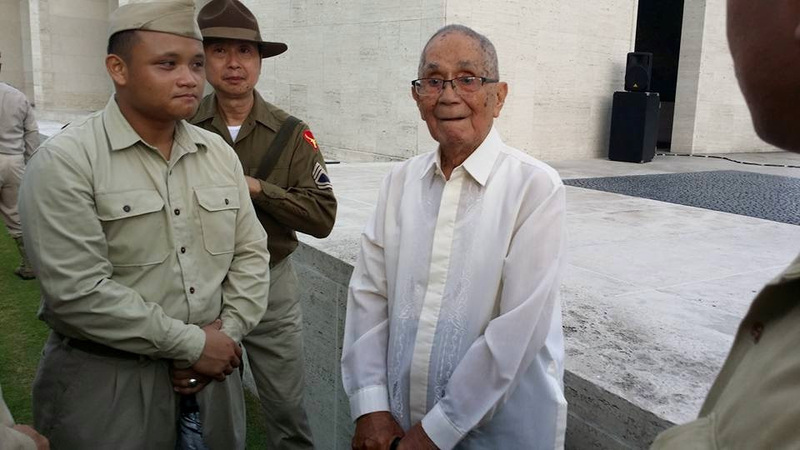 Cemetery staff were helpful in ensuring that everything went smoothly and attended the ceremony. 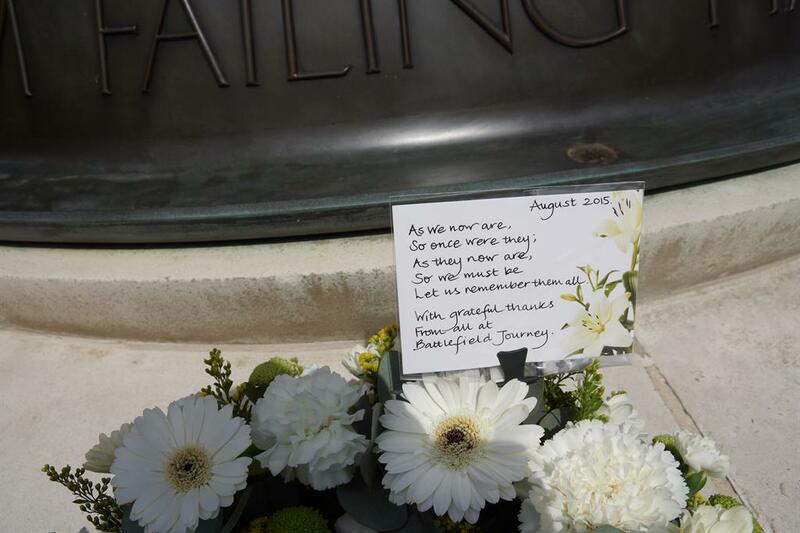 "A memorable afternoon for us all and a privilege to be part of this Tribute." 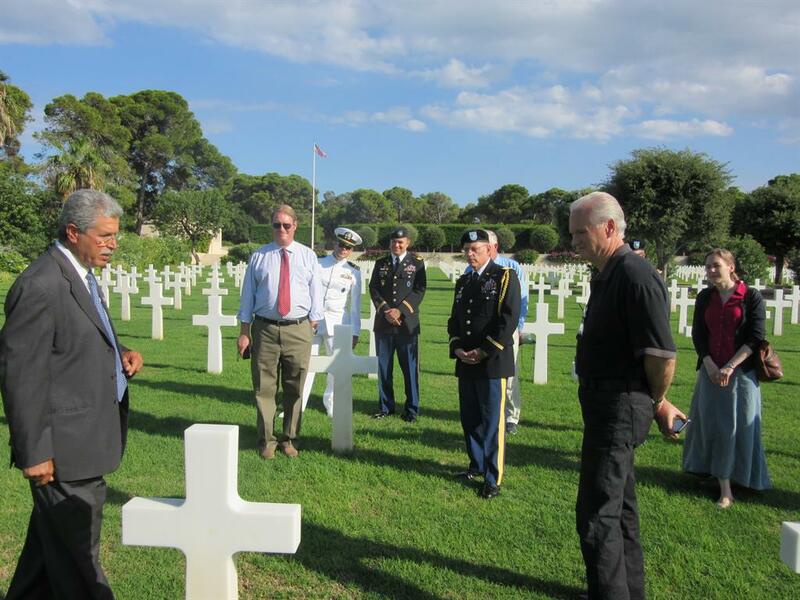 Ceremonies were also held at the American cemeteries in France and Belgium. The countdown to the 70th Anniversary Tribute was announced at the National Press Club in Washington, DC and a wreath placed at his gravesite in the Punchbowl on the anniversary of his death this December. 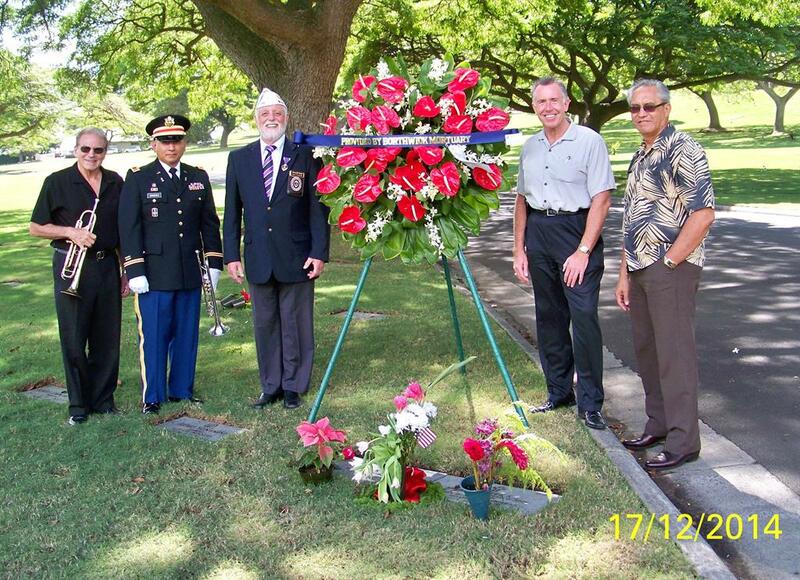 In 2015, members of the Military Order of the Purple Heart (MOPH) were asked by their National Commander Pat Little to organize Tribute wreath laying ceremonies in their communities. The Ladies Auxiliary of the MOPH created handmade wreaths for their ceremonies. 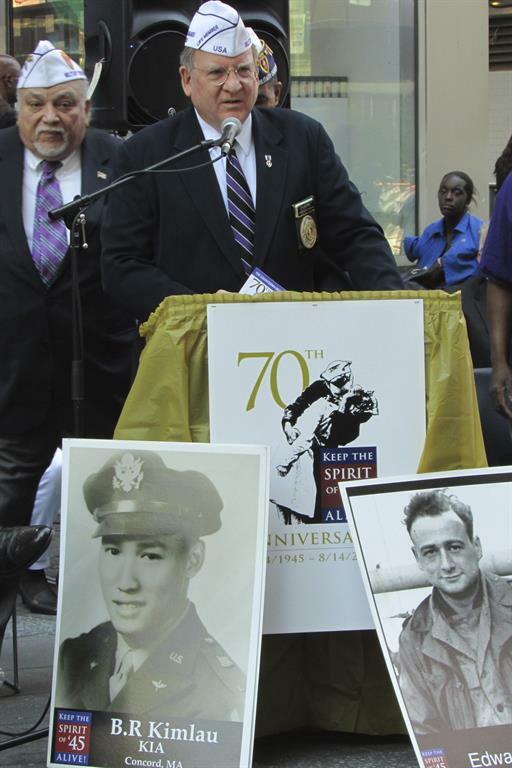 Pat Little, National Commander of the Military Order of the Purple Heart, announces "Tribute" in Times Square on August 14, 2014. 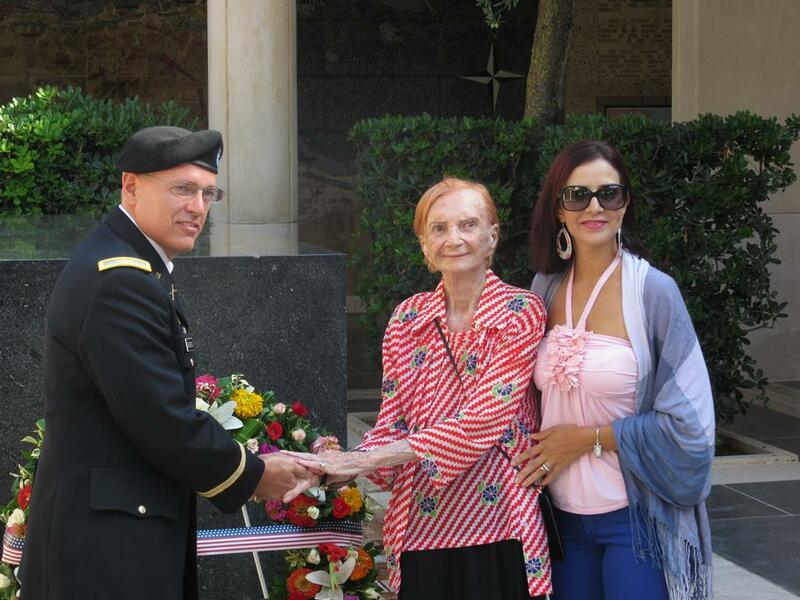 Pat's first act as National Commander was to honor the memory of fellow Army veteran Felix Sparks, who led the 3rd Army Battalion of the 157th Infantry Regiment that liberated Dachau concentration camp on April 29, 1945. Pat and his colleagues were joined by Sparks' wife Mary and members of his family. Members of the Military Order of the Purple Heart will be holding its "Tribute" at the World War II Memorial in Savannah, GA.
Members of the Military Order of the Purple Heart at the gravesite of Senator Dan Inouye, where the final wreath laying ceremony of the 70th Anniversary around the world Tribute will take place on Sunday, August 16, 2015. 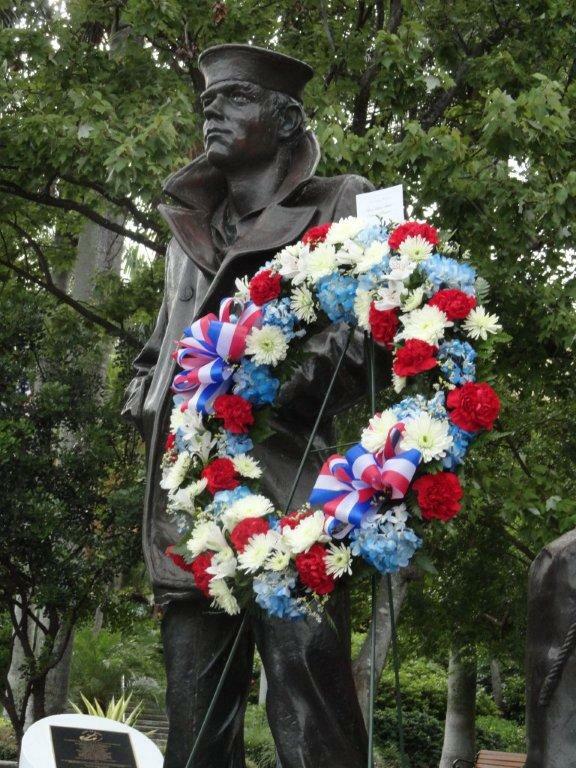 In July 2014, the Board of Directors of the Navy League voted unanimously to encourage its members to participate in Spirit of '45 Day, who are being asked to organize or participate in wreath laying ceremonies at all of the Navy Memorial's "Lone Sailor" and "Homecoming" statues as part of the 2015 70th anniversary around the ceremony. 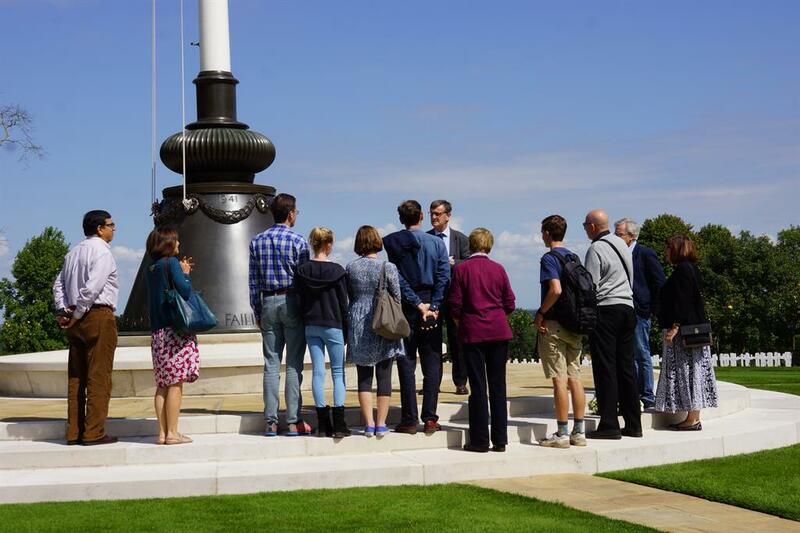 Members are also being encouraged to support the surviving WWII era ships, a number of which are hosted special events in 2015. 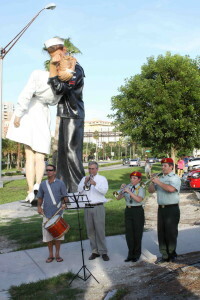 Since 2010, the American Society on Aging and the Assisted Living Federation of America have been promoting awareness and participation among its national network of senior living communities and care givers, and is helping spread the word about the 70th Anniversary Commemoration and the "Tribute." Atria Senior Living has been hosting annual Spirit of '45 Day events at all of its 189 communities for the past three years, receiving the 2012 Spirit of '45 Day National Community Partner Award. 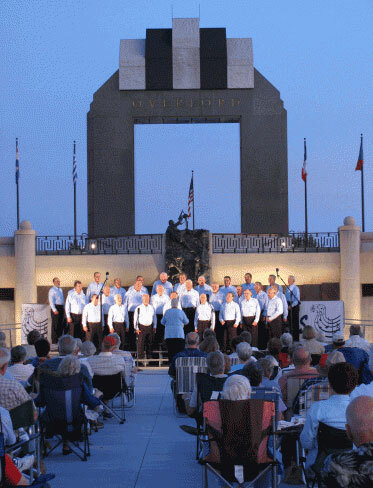 Also participating in the 2015 "Tribute" are members of "We Honor Veterans," a joint program of the VA and the National Hospice and Palliative Care Organization, that promotes regional veterans hospice partne rships among hospices that help serve the end-of-life needs of veterans and their families. 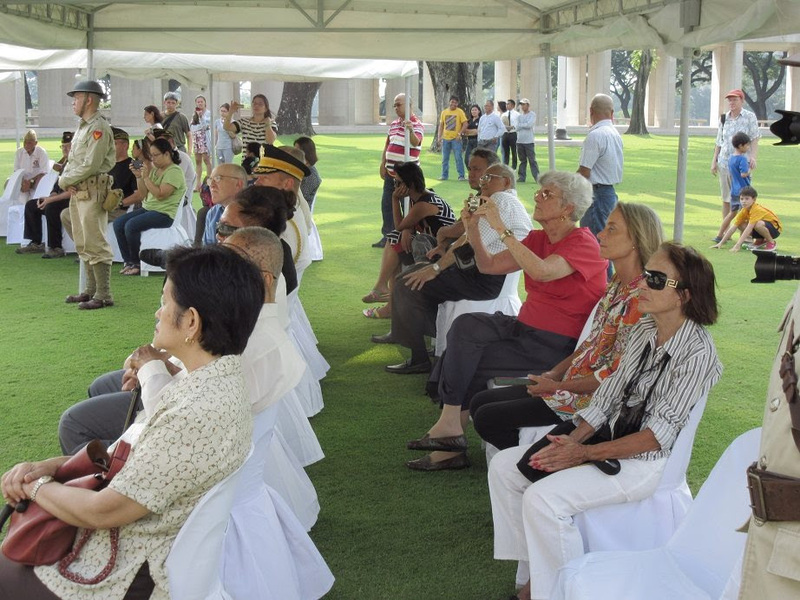 "We Honor Veterans" has been a strong supporter of the ongoing campaign to encourage public participation in Spirit of '45 Day each year in August. For example, in 2014, the Rhode Island Veterans Partnership, led by Beacon Hospice, an Amedysis company, hosted more than 20 ceremonies at different locations throughout the state. 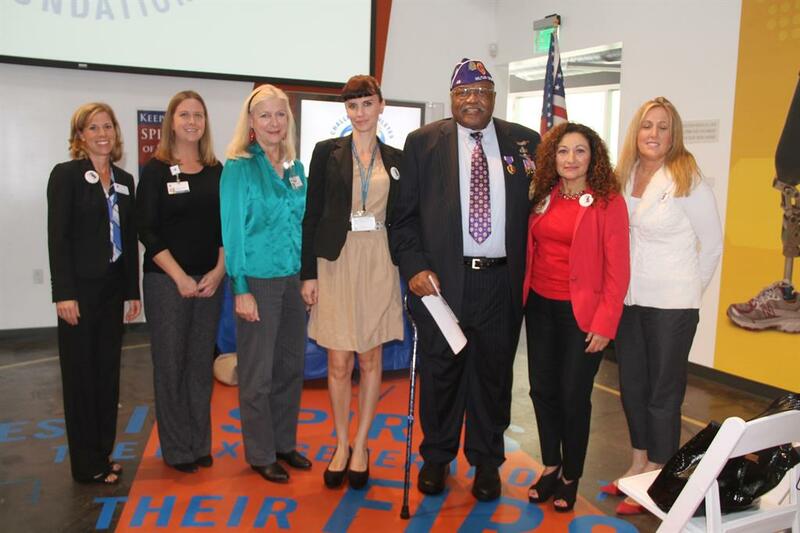 Elizabeth Hospice in San Diego held a media event on December 15, 2015, calling out to all Hospice Veterans Partnerships across the country to join them in organizing wreath laying ceremonies in their communities next August. 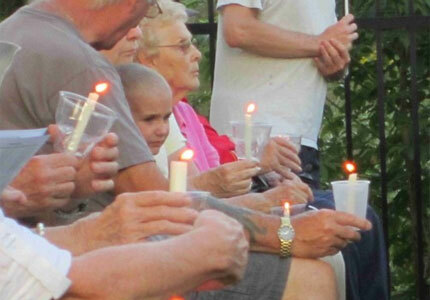 Funeral homes across the country are actively participating in the "Tribute." 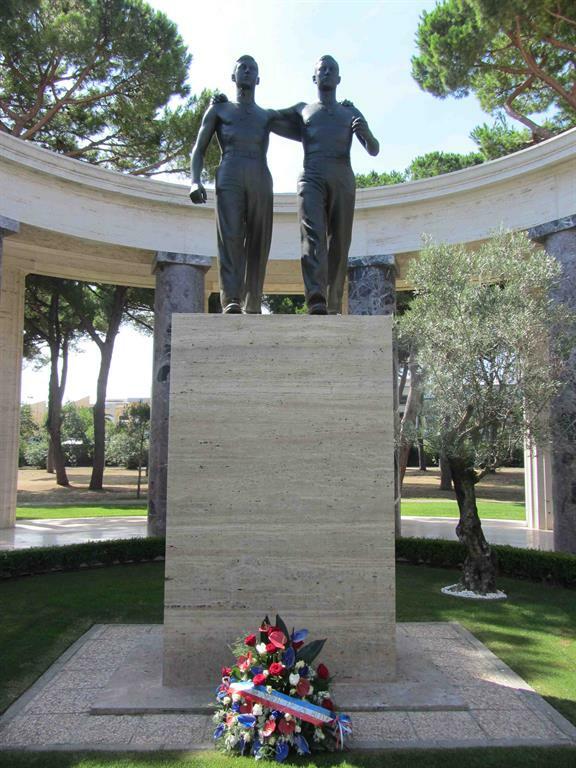 For example, members of the Dignity Memorial network - the nation's largest provider of funeral and cemetery services - have been hosting events in their communities, and donating their signature Spirit of '45 wreaths to groups that organize ceremonies in their communities. 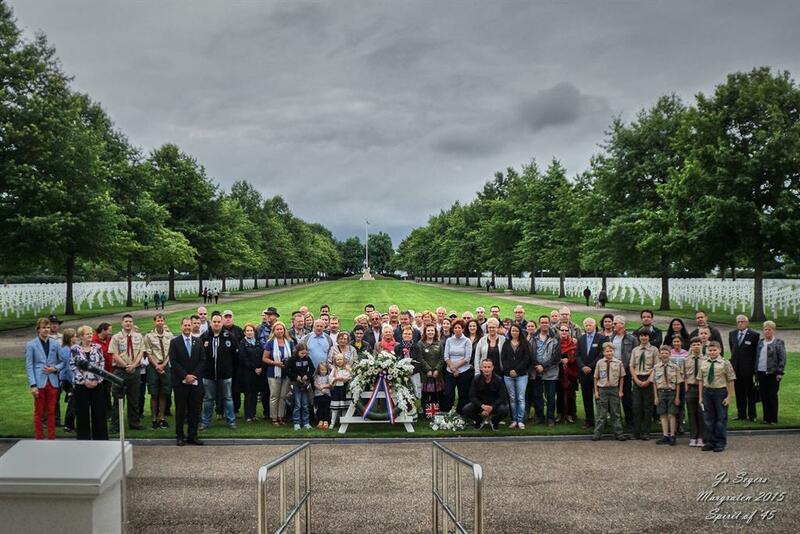 Carriage Services is encouraging all of its fellow funeral service and cemetery owners across America to host "WWII Family Reunions" to honor their loved ones who were members of our Greatest Generation. 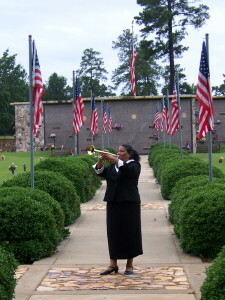 Bugles Across America volunteers performing "Taps"
Bugles Across America has been supporting the annual "Tribute" by providing volunteer buglers who are recruited through the nonprofit's website which maintains a database of more than 7,000 buglers. Auston O'Neill, Jr., a BAA member from Centreville, VA, traveled with his wife, Bonnie throughout the country in their motorhome to help publicize Spirit of '45 Day and raise public awareness about the upcoming 70th Anniversary commemoration. 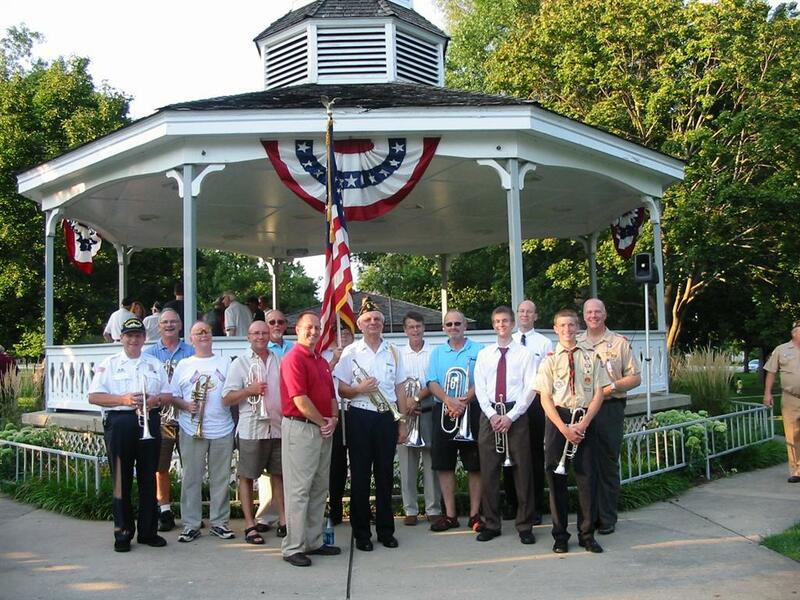 The Spirit of '45 Day National Unity Tour logged more than 45,000 miles, visiting over than 100 communities to encourage them to participate in the 2015 "Tribute." 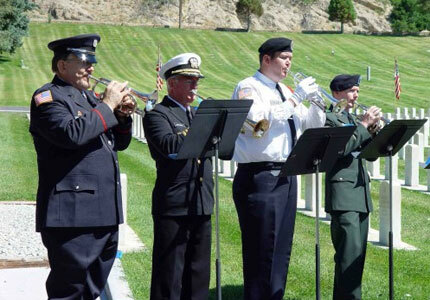 Auston O'Neill, Jr. on tour: performing "Taps" at the Nevada State Veterans Home in Las Vegas, NV, shaking hands with Bugles Across America founder Tom Day at the Elks National Veterans Memorial, Chicago, IL. With Spirit of '45 Day national spokesman, Gen. James P. Thayer, at the Oregon State Veterans Home in Portland, OR that is named after him. 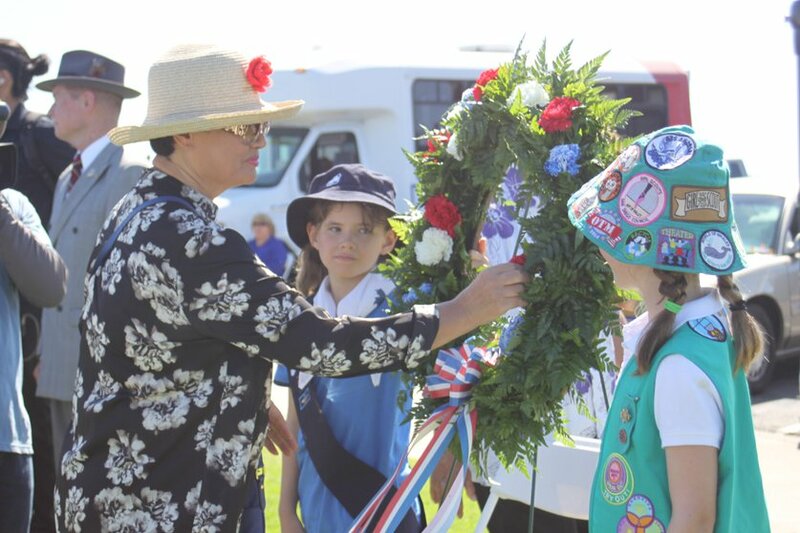 The American WWII War Orphans have also been actively participating in the annual "Tribute" in communities throughout America as a way to honor their fathers who were KIA during World War II. National Cemetery in Utah, the National D-Day Memorial in Bedford, VA, the Iwo Jima Survivors Memorial in Newington,CT, and the Navy Memorial in Washington, D.C.